If you’re a Sun Cellular subscribers you can now enjoy their latest and affordable browsing Sulit Surf rate. 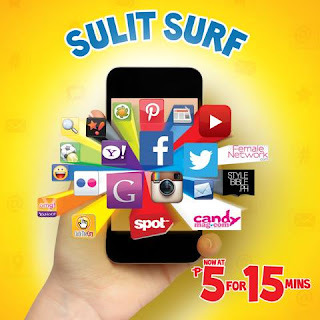 For only 5 pesos you can now able to browse wireless internet using Sun cellular network good for 15 minutes. As long as you’re using Sun card SIM this SULITSURF rate will apply once you use it to access a website using your phone or desktop. If you’re using USB stick and not registered to any unlisurf promos from Sun, automatically this browsing rate will once you use your regular load in connecting your broadband dashboard. No registration needed, all you have to a minimum balance of P5 pesos to avail the five per 15 minutes browsing rate. Make sure to activate your GPRS or internet settings of your phone by texting NET to 2300 for free or you can get more tips on how to configure GPRS MMS 3G settings of Sun Cellular. For broadband using make sure you have the right configuration when you use Sun Sulit Surf rate, the look in to your dashboard and choose the option for prepaid. Or if you want to know and get familiar with Sun Broadband settings just see Sun Wireless Broadband Confgiuration. To those who don’t want to worry about time limit while browsing their favorite sites and other web research just register to Sun Unlimited Internet Surfing promo.